When visiting here, be sure to include a trip to the Cliffs of Moher Ireland. They really are one of the most spectacular places to see anywhere. Join us here on a boat trip to the Cliffs. These cliffs in County Clare, Ireland stretch along the Atlantic coast for 8 kilometres. Their highest point is just north of O’Brien’s Tower where they measure 214 metres in height. The views from the cliffs are stunning. You can see as all of Galway Bay, the Aran Islands, the Connemara mountains, and to the South you can see as far as Loop Head. The Cliffs of Moher are Ireland’s biggest tourist attraction and draw 1 million visitors a year. 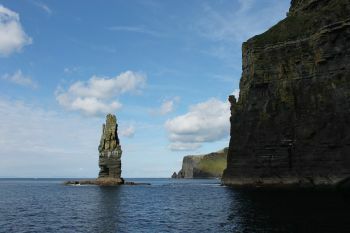 The lone rock formation you see at the bottom is called the Sea Stack, and measures 70 metres in height. 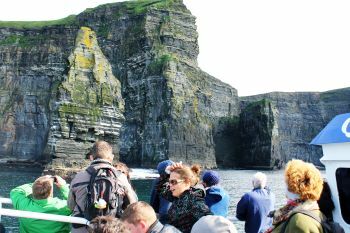 During the nesting season, the cliffs are home to thousands of sea birds, some species nesting there are protected or very rare. 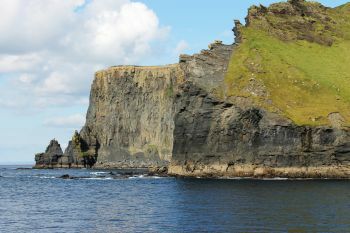 The cliffs, the visitor centre (‘Atlantic Edge’) and surrounding waters are a protected UNESCO Geo Park. These cliffs are not the highest in Ireland. There are higher sea cliffs in Donegal at around 600m, and on Achill Island in County Mayo at 668m. However, the Cliffs of Moher are much better known. The 30 million Euro visitor centre is Ireland's biggest investment in Eco-Tourism. The centre features grey water recycling, geothermal heating, solar panels, and other state of the art eco-technology. It was built into an existing cave into the mountain, and is covered with a grass roof. The Cliffs of Moher Ireland are a huge attraction for big wave surfers. They get here by boat, then mount their boards and wait for the thrill to come. The name Moher comes from the Irish word ‘mothar’ which means fort. There was an ancient stone fort at the cliffs, similar to those you can see on the Aran Islands, but it was dismantled in the early 19th century for building materials. Now that you have seen the Aran Islands in the distance, go check them out! There is a ferry to Inis Oirr from Doolin Pier that takes only 30 minutes, getting to Inis Meain and Inishmore takes a little longer. The Aran Islands have fascinating historical sites. Some old traditions are still alive there. Parking in the official car park will cost 6 Euros per adult (children under 16 are free) and includes access to the visitor centre where you will find a restaurant and a cafe as well as a gift shop. If you are hiking from Doolin, or parking elsewhere and don’t want to use the car park or visitor centre, visiting the cliffs is free because of an ancient Right of Way. The Cliffs of Moher are Ireland’s biggest tourist attraction, and have been for a couple of hundred years. O’Brien built O’Briens Tower as a Viewing Point for tourists as far back as 1835! The first thing I always notice when we arrive at Moher, is the fresh sea breeze. Even when we lived near the sea in Spiddal for some years, it was never as fresh or as strong as I feel it here. On a breezy day, you almost have to battle your way to get close to the cliff. Does a part of me imagine what it would be like to fly away? To leave solid ground behind? To get away from all worries? I can never quite put words on it. This exhilarating feeling subsides after a while giving way to a rare feeling of deep calm. Then I want to sit down and just be, taking in the scene, looking at the ocean below, at how small things are down there. I want to listen to the sounds around me, the wind, the ocean, to wind torn pieces of other people’s conversations. In those moments, I find myself thinking: Life could be so simple. Why do I, or why do we, clogg up our lives with so much troublesome clutter? Create so many unnecessary problems for ourselves? In the end of the day, life is just about enjoying it, and having a good time with your loved ones. Don’t you agree? In the end I usually leave feeling refreshed, and with a clear mind, as if the sea breeze had a cleansing effect on my thoughts. The feeling will last a good while. It’s always worth the visit. The best time of day for this type of contemplation, or maybe for a romantic moment, is around sunset on a clear day when the already stunning scene turns into pure magic. Our last visit to the cliffs was by boat. Cruising at the foot of the cliffs was a wonderful experience, totally different to being up above. It gives you a tangible sense for what ‘200 metres high’ really means. Watch our video at the top of this page to see more. The Cliffs of Moher themselves are in the proverbial middle of nowhere. 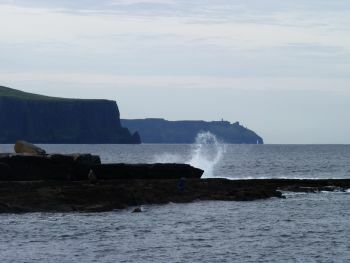 The small village of Liscannor lies 5 kilometres to the South of the Cliffs, and Doolin is 7 kilometres to the North. Both places have plenty of accommodation for all budgets, Doolin has mostly B and B’s, four hostels, and one hotel, where Liscannor is awash with hotels. 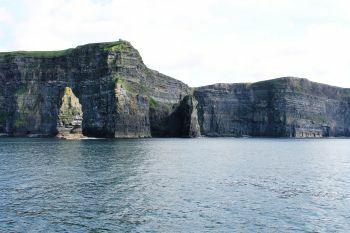 If you enjoyed this page about the Cliffs of Moher Ireland, please support us in building our audience. Use the social buttons at the top left or at the bottom of this page to give us a social shout out, you can also leave a Facebook comment below.